I vividly recall, in the autumn of ’99, a few days after Gen. Musharraf’s military coup of October 12th, driving through the Islamabad-Rawalpindi Highway that it was a pleasant and serene early evening and a steady calm prevailed in the atmosphere as if the Almighty had bestowed peace on this land of the pure and pious. As I drove somewhere on the main road, I observed an amazingly large and colorful billboard with a soldier’s picture glaring focusedly and directly over the passing crowd. 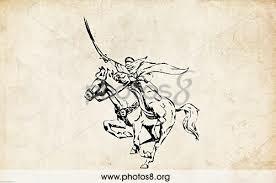 It was a towering hand-painted portrait of Gen. Pervez Musharraf in his military uniform riding on an elegant white horse, a sword raised in his right hand and his head covered in an Arabic “ghutra” (the traditional white head-cover that Arabs wear) and the caption under the portrait in large bold letters read: Pakistan’s Salahuddin Ayyubi. As I studied this billboard, a smile appeared on my lips without quite understanding why. I had known at the time that people all over the country had distributed sweets on the streets celebrating the end of the chaotic so-called democratic regime of Main Nawaz Sharif with the military establishment’s dispatching, lock stock and barrel, the civilian political establishment out of Pakistan’s political spectrum. Was the October 12th 1999 martial law a manifestation of a political tragedy in the history of Pakistan? This is an issue and a subject that political historians will continue to debate for years to come with many inconclusive judgments. This is how human history has been since humanity started recording events that greatly impacted the political discourse of societies all over the world. All we can do is to learn from our past and make amendments in our present and the future that is yet to come. Coming back to the portrait of Pakistan’s Salahuddin Ayyubi on a main street in Rawalpindi, I am certain of one thing: This portrait was an expression of the artist’s deep-rooted love of the legendary Islamic heroes; at the same time, it was a symbolic reflection of an imaginative wishful hope that a soldier of God’s kingdom had appeared to serve the people of Pakistan. It also reflected a deeply ingrained national psychological sentiment of public love, faith and emotional commitment to the sensitivity, trust, reliance on and emotional commitment of the common Pakistani folks towards Pakistan’s Armed Forces. And it was an expression of people’s faith in Pakistan’s military establishment as a national institution that will never betray this nation and will always protect it from the evil eye within and from outside. It indicated the awam’s firm faith in the Armed Forces as the guardians and protectors of their national identity, safety, stability and continued existence. One might disagree with me on the aforementioned contention, but this public perception and sentiment towards its Armed Forces still exists in totality in public consciousness. This sentiment is still reflected and remains absolutely intact as of today. Whether Musharraf and other military rulers came up to the people’s expectations is a justifiably controversial debate that will rage on for eternity with opposing arguments on both ends of the political spectrum. Irrespective of this debate, the question now is: But what of now? Where does the military leadership stand on September 2014 Pakistan? What should it do and what should it not? This is what the military establishment must do now and do urgently before matters get out of control: It must support public aspirations by making a “soft intervention” telling the PMLN government to “give people what they want or they will give it to them on their behalf.” It is my considered opinion that a vast majority of Pakistani common folks as well as the PTI and PAT, the two political parties battling the status quo forces to relinquish political-economic control over the country, will welcome the military establishment’s “soft intervention” to end the prevailing impasse. What the military leadership must not do is to impose martial law. Working within the parameters of the constitution and the Supreme Court’s guidance, the military establishment should endorse a national interim administration of non-political, non-party-affiliated actors to implement structural reforms in the entire political system strictly in accordance with constitutional requirements, inclusive of criteria for the election of public representatives, the setting up an independent Election Commission of Pakistan, the rigid adherence to the “Preamble” of the constitution, and so on and so forth. Let me stress the vital importance of the prevailing ground realities of present-day Pakistan standing in direct confrontation between two opposing ideas at Constitution Avenue in Islamabad. The fact of the matter is that self-denial of political impropriety and inexpedience is of no use now. The debate and the attempts to save today’s so-called democracy is irrelevant at this stage. This so-called democracy bears nothing in common to what democracy truly means. This democracy is a charade, a comedy of errors, a misconstrued staged drama, a mismanaged theatrical performance, and an idea whose time has passed. Let us embrace “truth” as a first step towards our salvation as a nation. Let’s just try to be honest, ethical, moral, and truly committed to uprightness and veracity. The adjudication of history is upon us. Let us arbitrate our future with fairness and esteemed judgment. Let us find out with objectivity, honesty and absoluteness if the May 2013 elections were rigged or not. We all know for a fact, given the nature of human beings and the multiple manifestations of being in political power, its invisible might and its effective tangible potency makes it absolutely impossible to have a free and fair judgment on the May 2013 elections as long as Mian Nawaz Sharif and the PMLN government remains in charge of national affairs. This is not an ethical or moral judgment on Main Nawaz Sharif as an individual, but simply an in-depth understanding of power dynamics and how actual power works in reality. Let us try to convince the Prime Minister to stand aside – and if the May 2013 elections are proven authentic and the PMLN public mandate established, the honorable Prime Minister comes back with full glory. How else could heaven honor a mortal human – giving a person political immortality for all times to come. What else could Mian Nawaz Sharif ask for in a one-time life on this earth? I affirm, in the name of Allah, my love of this nation’s simple people, their love for their soldiers, their aspirations, their hopes – and most of the time, I wonder how long their sufferings will continue. It is time that we all, as a nation, stand with the righteous, whoever you think they are – don’t you agree? This entry was posted in Nawaz Sharif, Pakistan Politics by drhaidermehdi. Bookmark the permalink.